Note: your beater and bowl must be super clean with no trace of oil. Wipe with vinegar and rinse to ensure success. Start beating egg whites at slow speed for a minute or so, until they foam throughout; Beat in the cream of tartar and gradually increase speed to fast, until the egg whites form stiff shining peaks. Reduce speed to moderate and add the applesauce by ½ cupfuls. Continue beating a high speed for a minute or so, until the mixture is stiff enough to hold its shape softly in a spoon. 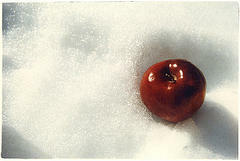 Apple snow will hold several hours in frig. (I found that it kept well for two days!). Fill goblets just prior to serving. Then dribble generous amounts of the sauce below over the apple snow. Put strawberries in to food processor or blender, squeeze a small amount of lime juice in and sprinkle stevia in to taste. Blend until completely smooth. Spoon over apple snow.